With more than 14,000 species of moss (Bryophyta) residing in moist, shady conditions, moss eventually may appear on your property. Moss is a group of small plants called bryophytes. Growing in a dense mat, moss has a root system that is only a threadlike stalk, making moss' removal somewhat simple. By using a simple household cleaner, such as oil soap, to remove the dirt, sand or debris buildup in a moss-affected area, you can dissuade moss from returning. Moss is opportunistic and grows where no competing plants live. Remove as much of the moss as possible from the affected area. 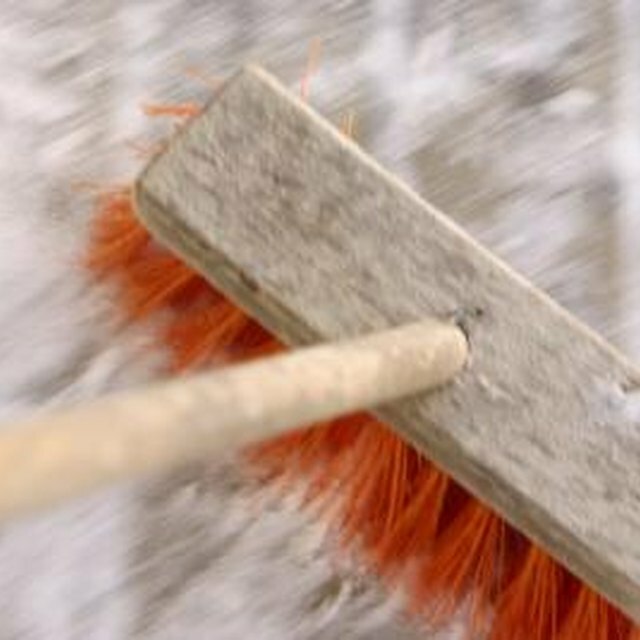 Use a stiff broom or long-handled brush to scrape the moss off the surface. Use a pressure washer on a surface such as a driveway, brick walkway and lawn furniture cushions, where the pressure washer's water stream will not cause damage. Pick up scraped-off moss while wearing gloves, and place that moss in a bucket or wheelbarrow. The removed moss can be transplanted to a more desirable area or put in the trash. Mix oil soap in a bucket with hot water by following the oil soap manufacturer's label directions, or use 1/4 cup of oil soap with every 1 gallon of hot water. Apply the oil soap and hot water mixture to the area from which you removed moss. Scrub the surface with a scrub brush or rag, removing the remainder of the moss along with debris that accumulated beneath it. Rinse the area with clean water, and allow it to dry thoroughly. Scrub the dry surface with a second application of the oil soap and hot water mixture if moss or debris remains on it. Several oil-based soaps are on the market and available at stores selling household cleaning supplies. Castile soap, which is a generic name of soap made from olive oil, usually is available where organic cleaning products are sold. Moss can be transplanted from an area where it isn't desired, including a roof, to an area where it is desired, such as between stone pavers. Herbicidal products formulated for moss may be harmful to other organisms in your area. Use such products with caution. Do not mix moss with collected yard waste because the moss' spores can spread.